Two Ministers Sarath Amunugama and Mahinda Wijesekara raising a point of order told Parliament today that there was a conspiracy to prevent Parliamentarians from voting for the Draft Constitution Bill. 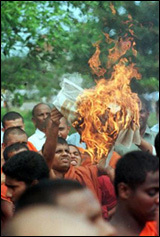 They informed the Speaker K.B.Ratnayake that some parliamentarians were sent abroad. According to reports, Mr.Dixon Perera who resigned from the Peoples Alliance on Monday, was sent to England Tuesday. Parliamentarians Upali Amarasiri, V.Puthirasignamany, V.G.Gunadasa, Ali Zahir Moulana, U.L.Mohamed, Mahinda Samarasinghe and Ms Rajamanohary Pulendran have been sent to Singapore. Ministers informed the Speaker that this was a ruse to prevent them from voting for the draft constitution bill. UNP Parliamentarians John Amaratunge and Abdul Cader accompanied these members abroad. UNP MP Dinesh Dodangoda was also flown to Bangkok yesterday, the Speaker was informed. Ms Srimani Athulathmudali, DUNLF parliamentarian also left for Geneva on a fortnight vacation on August 4. Meanwhile the debate on the Constitution Bill was adjourned on Tuesday evening to a as yet undetermined date. Around 4.30 in the evening, the Leader of the Parliament Mr.Ratnasiri Wickremanayake moved a motion to adjourn the debate. Political sources said that an agreement was reached at the party leaders' conference Tuesday morning to adjourn the debate. Minister of Home Affairs and Public Administration Mr.Ratnasiri Wickremanayake told the Parliament that the Government agreed to adjourn the debate on two counts. The first count was that about forty Parliamentarians had asked permission to participate in the debate. The second reason was that political parties have submitted over 60 amendments. He said that the governing party as well as the Tamil parties have submitted several amendments. The Government had decided to adjourn the debate and resume it later.